A high or rising underground water table can cause a wet flooded basement with water coming up through the floor. It will also cause cracks and dampness on the basement floor slab. Installation of a sump pump is the way to lower the water table and fix this kind of problem. 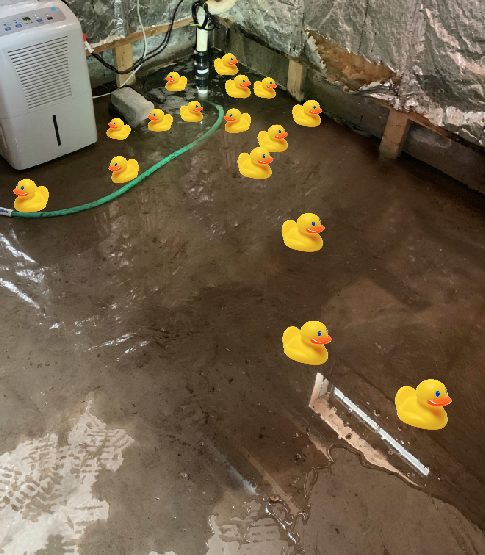 Additional options are emergency backup sump pumps (to prevent water in the basement from pump failure or a power outage), basement floor drainage, installation of a secondary sump pump location, and other waterproofing solutions. If you're experiencing signs of water only in specific areas of the basement, then it may not be a water table problem. The location and way the water is leaking into the basement will help in determining the source. Exterior surface water and groundwater can cause basement wall leaks and water on the basement floor. This type of water problem source is commonly mistaken as the water table. It comes from storm water, rainwater, and melting snow water that is not properly draining away from the house. You will typically see water leaking out the cove joint which is where the floor meets the walls, corners of basements, only specific areas in the basement, through cracks in poured concrete walls, and through the lower blocks of block foundation walls. Surface water leaks can occur everytime it rains or only when it rains hard, depending on how bad the situation is. These kind of water problems are corrected with foundation grading, foundation drainage, french drains, downspout drainage, gutters, and other solutions. A plumbing issue or a leaking pipe can also be a cause for water in the basement. We fix wet leaky basement wall problems. Water can leak through basement and foundation walls when a exterior problem exists. If too much storm water is draining toward or against the exterior basement wall, then it will cause water to over saturate the soil and build up in the ground of that area. The water can then seep through the foundation wall and into the basement. Water can pass through cracks, joints, and even the porous surface of a brand new cinder block wall when water is not properly diverted. Wet basement walls can range from dampness to water flooding out of the wall depending on how bad the problem is. Once water leaks through the basement wall it can fill up a perimeter drain trench along the edge of the floor or trail across the floor to the lowest point if there is no perimeter channel. These types of problems are most commonly associated with bad grading, roof water draining too close to the foundation, gutter downspouts draining too close to the house, flooded window wells, and other exterior issues. We install sump pump systems for controlling water table problems that effect basement floors. A sump pump will lower the water table under the basement floor. Another way water can pressure up through the basement floor is from surface water draining too close and into the foundation walls, then draining down through wall cracks or the hollow center of cinder block walls, building up under the basement floor slab, and then finally seeping up through floor cracks. ​​We provide basement waterproofing solutions for wet basement water problems. A inspection of the interior basement and exterior perimeter of the home is done to get a complete understanding of what is going on. In most situations we can determine the source or cause of a water problem even if it is not currently happening. Some basement water problems are directly associated to a high water table, others to surface storm water draining too close to the foundation walls, or both can be happening. Many problems are fixed incorrectly because companies are only selling a specific interior or exterior solution, so they become bias in the recommending of a solution. With vast knowledge and experience in the industry since 2005, we are familiar with all types of solutions and routinely recommend the solution that best fits the problem, even if it is not one we provide. We provide exterior basement waterproofing and drainage solutions to fix specific water problems from their source. Many wet and leaky basement walls are caused by a exterior problem that needs to be fixed. Most common is roof water draining onto bad grading around the house. This will allow rainwater and melting snow water to drain against the foundation. We provide re-grading around foundation walls to fix the slope of the land to shed storm water away from the home. We also install custom drainage solutions to divert water away from exterior basement walls. Contact us for exterior basement waterproofing options. Sump pumps are used for preventing a wet flooded basement floor. Not all homes need a sump pump system. If there are signs of a high water table, then it would be important to have a sump pump. We provide emergency service for sump pumps, as well as complete sump pump system installation. If your sump pump fails or has a problem, we can inspect it. We can also make adjustments to a current sump pump system if it is running too much or not working properly. There should always be a check valve installed on the sump pump discharge piping. We pipe sump pump systems from the pump to the exterior of the home with 1.5 inch pvc pipe. For sump pump systems we also install underground pipe to drain the water away from the house properly. We use 4 inch drain pipe, a freeze protection fitting, and pitching of the entire drain pipe to prevent frozen sump pump drainage. Window wells are sometimes needed in order to properly re-grade around foundation walls. The window well will allow for the height of the grading to be raised up, while keeping soil away from the basement window. We install and replace window wells. A very common window well problem that we deal with is window wells that are flooding with water. Standing water in a window well is a sign that there is bad grading, a drainage problem, a downspout too close, or too much roof water draining in that area. Flooded window wells can cause foundation wall cracks and water to leak through the basement walls. We provide window well grading and drainage solutions.